In ancient China, chariots were prominent battle vehicles. They emerged during the Xia Dynasty around 2,000 B.C., and were used to transport infantry and weaponry across battlefields. Chinese chariots usually carried three soldiers. The commander took the left flank, the warrior the right, and the charioteer the center. Ancient charioteers had to undergo specialized training in yu, the art of chariot riding. 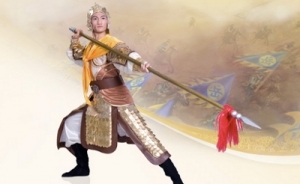 Yu is considered one of the six arts that a true gentleman must master as part of Confucian education. During the chaotic times of the Eastern Zhou period (770–221 B.C. ), a leader’s power was measured by the number of battle chariots he possessed. Battle chariots were equipped with defense apparatuses like leather armor and shields. Their weapons included the ge, or dagger-axe, which was used to make short-range strikes on enemy chariots, and the bow and arrow. A chariot unit consisted of three armored warriors, 72 infantryman, and 25 support staff, making a team 100 strong. But the chariot’s bulk made it difficult to steer and only suitable for flat ground warfare. By the Han Dynasty (206 B.C.–220 C.E. ), the Chinese chariot was replaced by more agile cavalry and foot soldiers. Battle chariots also carried banners, flags, and drums in order to maintain communication and pass instruction between carts. 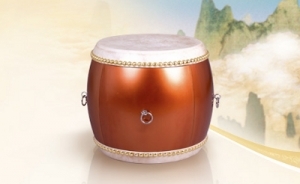 These drums are featured in the battle carts used in Shen Yun performances. These ancient Chinese drums were important for drumming up morale, intimidating the enemy, and guiding elaborate and rapid formation changes on the battlefield.